Sax maestro Gerard McChrystal to include 'Travel Pieces' in his one man show, 'Stand Up'. 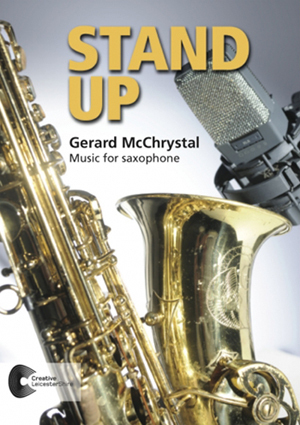 London based saxophonist Gerard McChrystal will include a newly arranged version of 'Travel Pieces' for soprano sax and digital delay in his all new one man show, 'Stand Up'. 'Travel Pieces', is a five movement suite, (originally written for guitar and digital delay), inspired by different aspects of travel, Air Travel, Sea Travel, Land Travel, Space Travel and Time Travel. Each movement utililizes a different delay, (or echo), which results in the formation of a pure canon as the performer plays along with what has already been played just moments before. The result is a mesmeric duo, without a second performer! Gerard McChrystal comes from Derry, N.Ireland. To date he has performed in over 30 countries including London's Wigmore Hall, San Francisco Opera House and Suttgart Stattshalle. He has performed with Philip Glass, Soweto String Quartet, guitarist Craig Ogden, The Syzmanowski String Quartet, The Smith Quartet, tenorist Tommy Smith, Irish choir Anuna, Ensemble Bash as well as many orchestras including The Philharmonia, San Francisco Ballet Orchestra, BBC Scottish Symphony Orchestra, BBC NOW, BBC Concert Orchestra, National Symphony of Ireland and Stuttgart Statsorchestre. Gerard is a gold endorsee for RICO and an ambassador for Derry-Londonderry UK City of Culture 2013. The full original guitar version of 'Travel Pieces', (written for guitarist Damien Kelly), can be heard on the album, 'New Frontiers'.